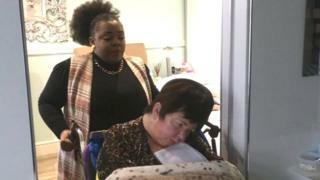 A Zimbabwean carer who has been a UK resident for the past 12 years says she fears persecution if she is deported. Siphiwe Moyo wanted to escape violence as she was a member of the opposition party Movement for Democratic Change. She has cared for quadriplegic patient Yvonne Gade from Trull, Somerset, for nine years, but her visa permission was refused after a relationship breakdown. The Home Office said deportation would only happen when a safe return was guaranteed. Ms Gade requires 24-hour care after a brain aneurysm, and her partner Karen Atwell has also been diagnosed with an aggressive form of breast cancer. "Siphiwe is family - she's lived with us for eight-and-a-half years," said Ms Atwell. "Before her, we didn't have a consistent carer and it was really hard." Ms Atwell said the Home Office had not considered the impact the deportation would have on her partner. "[Ms Moyo's] irreplaceable. We can't just make up for eight-and-a-half years' experience overnight with another carer," she added. Ms Moyo said that after her relationship broke down the Home Office told her last month she had to leave. She said the prospect of returning to Zimbabwe was "frightening". "I don't want to go back, we all see what's happening there," Ms Moyo said. "People are killed and tortured. They know I've been here for 10 years, and I don't know what's waiting for me there. "I - with the Home Office - would look at the other side, I've worked, protected Yvonne and paid my taxes." A Home Office spokesperson said: "All applications are considered on their individual merits, on the basis of the evidence available and in line with UK immigration rules. "Where applications are refused removal is only enforced when we and the courts conclude that it is safe to do so, with a safe route of return." The UK government's own travel advice for Britons travelling to Zimbabwe advises them to "avoid political activity, or activities which could be construed as such, including political discussions in public places". It also advises people to avoid all demonstrations and rallies as they "can be unpredictable and may turn violent".